Not too long ago I pointed to a place in a Christian Palestinian Aramaic text translated from Greek where there was a conspicuous confluence of languages (see here). Here is a similar place in a Georgian hagiographic text translated from the Armenian version of a Syriac text, referring to a name in Arabic, that of the saint, ʿAbd al-Masīḥ. Gérard Garitte published the Georgian text with a Latin translation in “La passion géorgienne de Saint ʿAbd al-Masīḥ,” Le Muséon 79 (1966): 187–237. 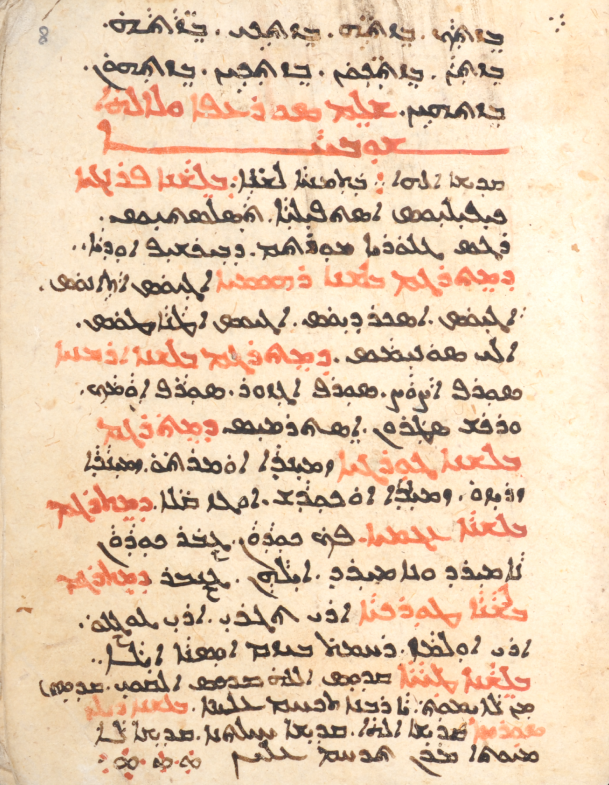 If you wish to compare the Georgian with other versions of this text, here is the information: The Syriac was published by Corluy in AB 5 (1886): 5-52 (here, 43.11-44.5); the story is also in Bedjan’s AMS 1: 173-201. There are (at least) three recensions in Armenian, one of which is in Vark’ ew vkaybanut’iwnk’ srboc’ 1: 6-25 (here, 22.5-13). Finally, Peeters published the Arabic (tr. from Syr.) in AB 44 (1926): 270-341 (here, 332.4-9). გან-უ-კჳრ-დ-ა aor 3sg (indir. vb, w/ the CV -უ- for 3rd person, here pl, object) განკჳრვება to be amazed (for იხილეს და განუკჳრდა, as here, cf. Lk 2:48 and Acts 12:16). On the apparent confusion of impf and aor with -დ- in verbs of this kind, see Deeters, § 374, with this root on p. 202. 22.3 ხოლო მნეთა მათ ჰრქუეს: «სახელი მაგისი არს აბდალმესია, რომელი ითარგმანების ქრისტედოლე, ხოლო ქართულად მონაჲ ქრისტჱსი»; და აუწყეს ვითარ სახედ იწამა. Previously I have highlighted some Georgian manuscripts that the Bibliothèque nationale de France has graciously made freely available online. Here is a list of Judeo-Persian manuscripts from the BnF that I have been able to find at Gallica. (If I happen to have missed one, please let me know.) They mostly come from the fifteenth-seventeenth centuries, some of them with colophons. While these manuscripts obviously fall outside of the delimiter “eastern Christian” that guides most of the posts appearing here, I know that at least some readers of the blog have, just as I do, broader interests than that delimiter allows. Most of the texts here are biblical; for details about published biblical texts in Persian (Judeo-Persian and otherwise), see my hitherto incomplete bibliography here. These manuscripts often have a verse in Hebrew followed immediately by a Persian translation. For the Catalogues des manuscrits hébreux et samaritains de la Bibliothèque Impériale (Munk, Derenbourg, Franck, and Zotenberg) see at Gallica here and archive.org here. The few remarks I give below rely on this volume. Un grand merci à la BnF de partager ces manuscrits! The Persian text of №s 70-71 is said to follow Targum Onqelos closely. Probably the same scribe as №s 70-71. Different from the version in № 97. Like some of the other JP translations, this one follows Onqelos more than the MT. The margins have some of the Persian in Perso-Arabic script. This book was written in the village of Lār in the year 1912 [AG, = 1600/1]. The Aramaic text, for whatever it’s worth (Kaufman’s comments here), is available at the CAL site sub Late Jewish Literary Aramaic, text 81406. While looking lately at the records for some Judeo-Persian manuscripts in Margoliouth’s Catalogue of the Hebrew and Samaritan Manuscripts in the British Museum, I stumbled across the record for BL Add. 19342 (№ 158 in the catalog, p. 119), a manuscript with parts of the Psalter in Hebrew, but written in Gǝʿǝz script (Fidäl), something we can call Ethio-Hebrew on the pattern of the descriptors Judeo-Arabic, Judeo-Persian, etc. (We could also call Garšūnī Syro-Arabic, but custom has deemed otherwise.) Until this, I had never encountered this particular phenomenon, but as Margoliouth notes, Wright had previously described the manuscript as part of the Ethiopic collection (№ 127, p. 81). It so happens that this manuscript is among the many already made available through the British Library’s digitization project: see here. Following Wright, Margoliouth dates the manuscript to the 18th century. It contains Pss 1-11:4, 51, 121, 123, 130, 140. Unlike most Ethiopic manuscripts, this one is on paper, not parchment. Ps 1:3 in Ethio-Hebrew, BL Add. 19432, f. 1r. Source. Ps 2:1-2 in Ethio-Hebrew, BL Add. 19432, f. 1v. Source. 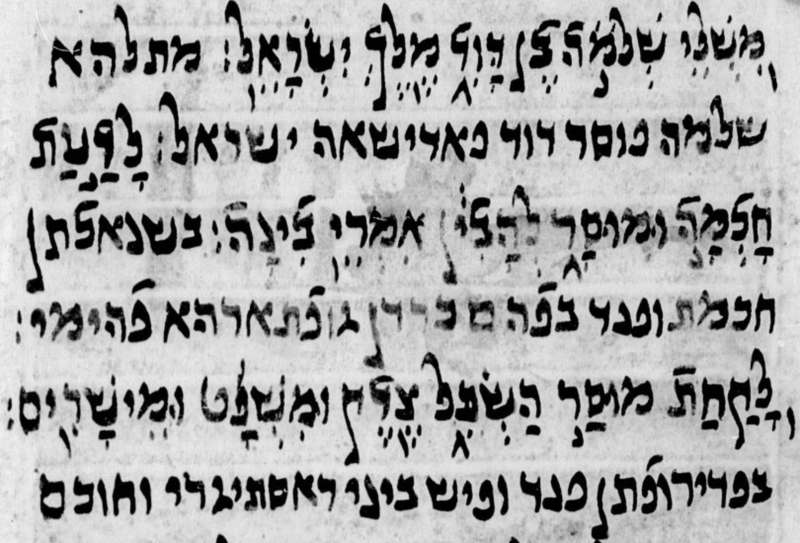 Ps 121 in Ethio-Hebrew, BL Add. 19432, f. 9r. Source. The Hebrew h marking final -ā or -e is written (e.g. ሀያህ, ያዓሢህ [ሤ?]). Hebrew ṣ is spelled with Gǝʿǝz ፀ (e.g. ክዔፅ, ኤሬፅ) or ጸ (e.g. ይትያጽቡ). Hebrew š is generally spelled with Gǝʿǝz ሠ (e.g. ሣቱል, አሤር, ሦምሬካ), as is Hebrew ś (ያዓሢህ [ሤ?]). In at least one place (Ps 121:6), though, the Ethiopic letter ሸ (not used in Gǝʿǝz, but used in other Ethiosemitic languages) is fittingly used for š: ሀሸሜስ häšämes, but note that the last consonant here, which should also be š, is here a simple s (not ś as usual elsewhere in the manuscript), so that we end up with a form like Arabic šams. Spirantized Hebrew k is spelled with Gǝʿǝz ኀ (e.g. ውኁል, also note the vowel, wǝxul). Spirantization in the other BGDKPT letters is not marked (e.g. ያቦእ). The Hebrew ḥ in yārēaḥ is written with Gǝʿǝz ሀ (ውያሬሀ). The Hebrew impf prefix yi- is spelled with Gǝʿǝz yǝ- (e.g. ይቴን, ይቦል). The prefix ye- is spelled with Gǝʿǝz yä- (የሄጉ; note the incorrect vowel on the h). The tetragrammaton is written ይሁዋህ yǝhuwah. The Gǝʿǝz vowel i often appears where we expect e. The latter vowel is used for Heb segol (e.g. ኤሬፅ, ኤል, ኤት); for the pausal form ā́reṣ we have አሬፅ. An Ethiopism is ሚኵል for Heb mikkol. There are some mistakes, such as ወዓላሁ for וְעָלֵ֥הוּ. The first two words of Ps 2 are missing. Καὶ ἐπλάνησέ τε οὕτω τὴν Ῥωμαίων πόλιν, ὥστε Κλαύδιον ἀνδριάντα αὐτου στῆσαι, ὑπογράψαντα τῇ Ῥωμαίων γλώττῃ, ΣΙΜΟΝΙ ΔΕΟ ΣΑΓΚΤΩ, ὅπερ ἑρμηνευόμενον δηλοῖ, Σίμωνι Θεῷ ἁγίῳ. The translation is straightforward and makes sense, but the appearance of the Latin inscription, which the CPA translator would have seen in Greek letters, is a bit mangled, not surprisingly. There is no indication of the dative -i in symwn, the -s of dʔyws should be deleted, and the znqṭw, while reflecting the right pronunciation of -γκτ-/-nct-, is a little odd for having a z- at the beginning. In addition, in the CPA version of the Greek translation of the Latin inscription, we really expect the preposition l- to mark the dedication, but there is not one. Every translation naturally deals with at least two languages, but sometimes, as here, another language also makes an appearance, and, also as here, that appearance may offer an opportunity for some confusion, yet it also grants us an opportunity to have a glimpse at translators and/or scribes with their feet in a more or less complicated labyrinth of more than two languages. *Greek and CPA published side-by-side in Christa Müller-Kessler and Michael Sokoloff, The Catechism of Cyril of Jerusalem in the Christian Palestinian Aramaic Version, A Corpus of Christian Palestinian Aramaic Version 5 (Groningen, 1999), here pp. 60-61. My involvement in cataloging Syriac and Arabic manuscripts over the last few years has impressed upon me how often and actively Syriac Orthodox and Chaldean scribes (and presumably, readers) used Garšūnī: it is anything but an isolated occurrence in these collections. This brings to the fore questions of how these scribes and readers thought about Garšūnī. Did they consider it simply a writing system, a certain kind of Arabic, or something else? At least a few specific references to “Garšūnī” in colophons may help us answer them. Scribes sometimes make reference to their transcriptions from Arabic script into Syriac script, and elsewhere a scribe mentions translation “from Garšūnī into Syriac” (CFMM 256, p. 344; after another text in the same manuscript, p. 349, we have in Arabic script “…who transcribed and copied [naqala wa-kataba] from Arabic into Garšūnī”). Such statements show that scribes certainly considered Arabic and Garšūnī distinctly. While cataloging Saint Mark’s Monastery, Jerusalem, (SMMJ) № 167 recently, I found in the colophon a reference to Garšūnī unlike any that I’d seen before, in which the scribe refers, not to the Garšūnī “text” or “copy” (nusḫa, as in SMMJ 140, f. 132v), but rather to “the Garšūnī language” (lisān al-garšūnī). Here is an English translation of the relevant part of the colophon, with the images from the manuscript below. …[God], in whose help this blessed book is finished and completed, the book of Mar Ephrem the Syrian. The means for copying it were not available with us at the monastery, so we found it with a Greek [rūmī] priest from Beit Jala, a friend of ours, and we took it on loan, so that we could read in it. We observed that it was a priceless jewel. It was written in Arabic, so we, the wretched, with his holiness, our revered lord, the honored Muṭrān, Ǧirǧis Mār Grigorios, were interested in transcribing it into the Garšūnī language, so that reading it might be easy for the novice monks, that they might obtain the salvation of their souls. UPDATE (June 17, 2014): Thanks to Salam Rassi for help on the phrase ʕalá sabīl al-ʕīra. 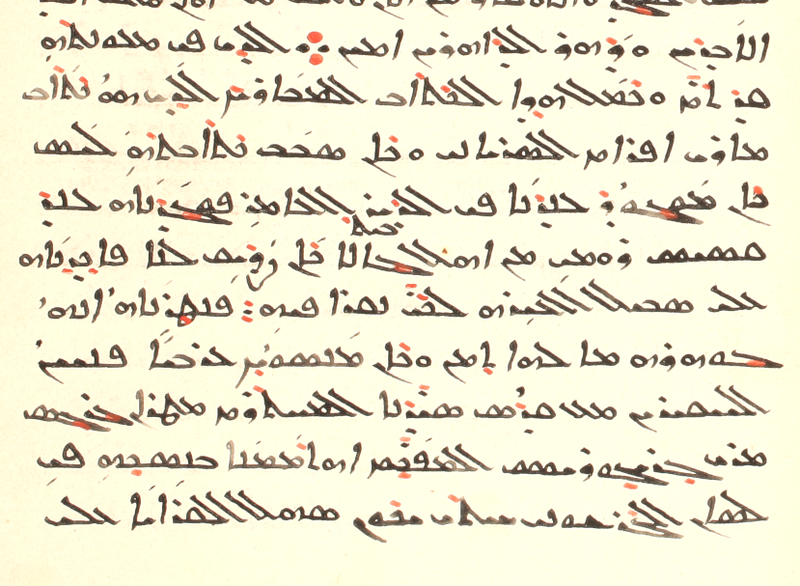 Among other uses of Syriac script for non-Syriac languages, we know well of Garšūnī (or Syro-Arabic) and even Syro-Armenian and Syro-Kurdish (especially the Lawij of Basilios Šemʕon al-Ṭūrānī), but I was surprised to find in my recent cataloging work a small example of Georgian written in Syriac script. * The text, which follows several pages of a grammatical list, is on one page of CCM 10 (olim Mardin 81) and it was not noted by Addai Scher, who cataloged the collection in the early twentieth century. It’s the trisagion (vel sim. : the Latin may be a garbled version of lines from this Easter hymn) in eight languages: Latin, Greek, Armenian, Georgian, Persian, Turkish, Arabic, and finally, Syriac. Much might be said about how these languages are represented in this short text, but here I’m only considering the Georgian part, lines 13-14 below. The last one, also with 1pl object, is different from the trisagion form only in orthography. The form from Mt 9:27 and 20:30 is built on the same root, but without the preverb შე- and with the 1st person marker მ- instead of გუ- (or variations thereof). The form in Mt 20:31 also has no preverb, but (allowing for the slight orthographic difference) it has the same 1pl markers as in the triasagion form. Finally, those in Mt 15:22 and 17:15 do have the preverb, and given their objects — 1sg and the 3rd person object “my son”, respectively — these forms look exactly as we would expect, the objects marked by -მ- in the first case and -∅- in the second, and naturally without the final -ნ to mark a plural object. 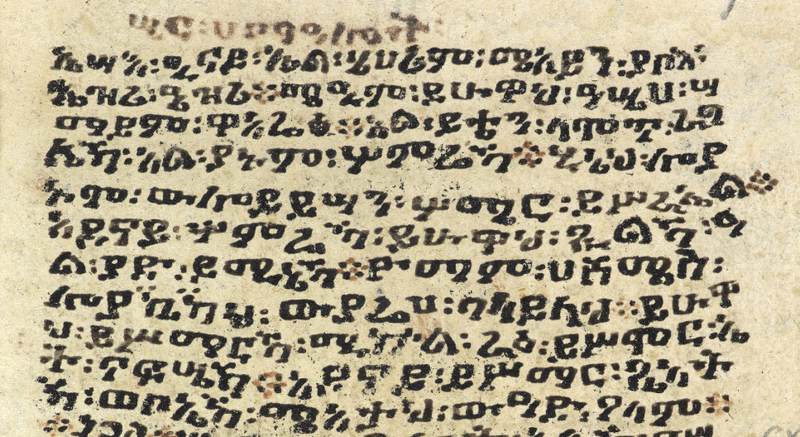 If we compare this Georgian text with the Syriac script above, we find the latter to be muddled. Recognizable to some degree are წმინდაო (Syr. zmyndʔ), ღმერთო (ʔwmrtw), ძლიერო (zryzw), and უკვდავო (ʔwkwdš), but that’s all I can see. While the Syriac letters are hardly as fitting for Georgian as the Georgian alphabet itself is, even with Syriac one might have gotten closer than the orthography in this example. What is the source of the confusion? Did this scribe write these lines from something he heard or knew himself? Did he copy from another written source also in Syriac letters? I would be happy to hear about any other examples of Georgian written in Syriac letters, but I suspect it is a rare phenomenon. * Thanks for their comments to Hidemi Takahashi and Nathan Chase, with whom I discussed this text a little.